Do you need essay writing practice before a major English test? If you teach ESL classes, do you need materials to help your students practice basic essay writing skills? Keep reading for an overview of things to consider in English essay writing practice (and in order to get high scores on essays for classes and writing tests.) Below that are inexpensive packets of essay practice materials for individual or classroom use. When writing an essay for a class assignment or for a major test like the IELTS essay writing or TOEFL Writing Tests, it’s important to understand the essay prompt—the instructions on what to write about. Be especially careful about using someone’s exact words. If you use someone else’s words without giving them credit, it’s plagiarism, which is a very serious offense in English writing. The only time not to express your own opinion is when you are specifically asked to paraphrase (restate) or summarize other people’s ideas or when asked to objectively (i.e. without personal bias or opinion) present or analyze data. Although it is important to understand the exact meaning of the words in the essay prompt (a main purpose of the essay practice packets below, it is not necessary to use those words yourself. Write your essay with English words you feel comfortable using. It is NOT a good idea to try to impress examiners with fancy vocabulary you do not understand completely! However, most of the requirements for writing good essays are the same as for any formal writing in English. Watch your spelling, capitalization (first word of each sentence, proper names like England and English, etc. ), and punctuation. Write clear transitions between ideas and paragraphs. Pay special attention to your introduction. Make sure it clearly states your main point or argument and is as interesting as you can make it. You can get essay writing practice by yourself using the guidelines above. Also check Writing Test Vocabulary to be sure you understand the exact meanings of words commonly used in essay instructions (prompts), so you can give your examiners what they are looking for. It can make a real difference in your score! 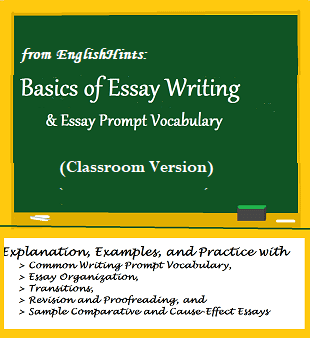 If you would like a more detailed, step-by-step approach to essay writing practice, study this inexpensive pdf of English essay writing explanations, examples, and practice exercises. This packet is quite similar to the classroom pdf packet below, except without the lesson plans or Scientific Method vocabulary section and with a little more explanation of some ideas. Click the button below to buy it now for $6.00. Help your English learners master the vocabulary of writing test prompts and the basics of English essay writing. 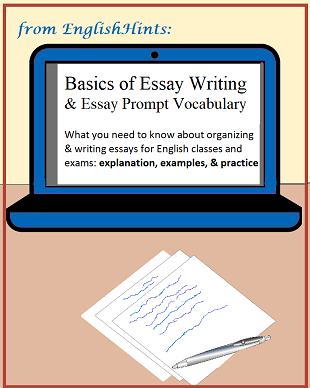 Basics of Essay Writing includes six lessons demonstrating and practicing essential academic vocabulary and essay writing skills. It includes brief readings on communication and essay organization, a vocabulary game and crossword puzzle and practice with transition words and proofreading before students try essay writing themselves. This packet is a less expensive version of my Basic Academic Vocabulary packet. It is 33 pages and contains almost all of the resources and practice activities in the Basic Academic Vocabulary packet except the task cards. Common Core Standards addressed CCSS.W8,2 &2c.,8.5, 9-10.2c & 5; L.8,4a ,& L.9-10.4a. Click below to download it for $8.00. See English Grammar Worksheets if you would like to practice different tenses (especially irregular past tense verbs). It also has a free download of the Revision & Proofreading Checklist included in the packets above. Home > ESL Worksheets> English Essay Writing Practice.